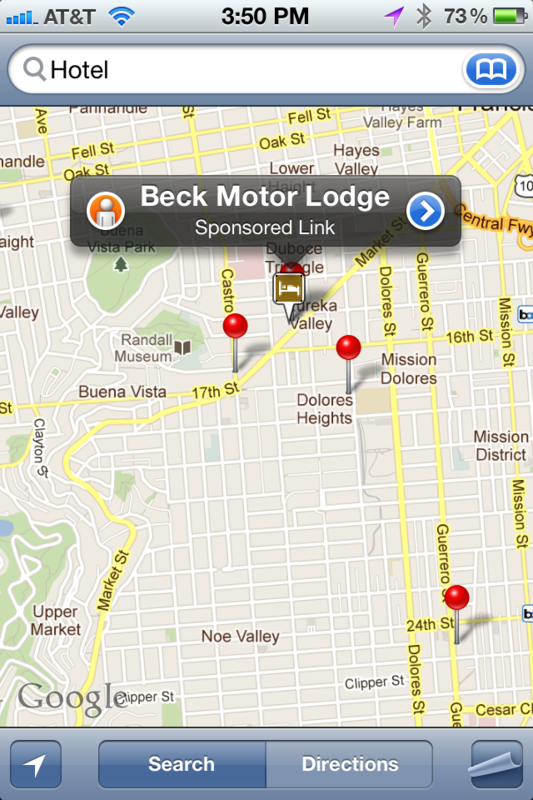 Whether you realize it or not, there are Google ads in the standard Maps.app on your iPhone. Every few months, someone notices and makes a big stink about them online, but the fact of the matter is that they only have Apple to blame. The ads, which were introduced in late 2009, come in the form of a ‘Sponsored Link’ that appears in the results of any search of the Maps app on the iPhone. The icon is different from the simple pins that appear for the other results and is often coded to the type of search that you make. If it is a hotel result, for instance, it is a small bed icon. If it is a restaurant, it’s a tiny picture of a plate and silverware. It is significantly different from the shiny red pin icon and jumps right out at you when you glance at your results. Which, I would guess, is the point. When you tap on the icon, you’ll see that the result is labeled as a ‘Sponsored Link’. This behavior is very similar to the sponsored links that appear in Google’s map offerings on Android or the web. It’s easy to make assumptions that the ads came from Google. 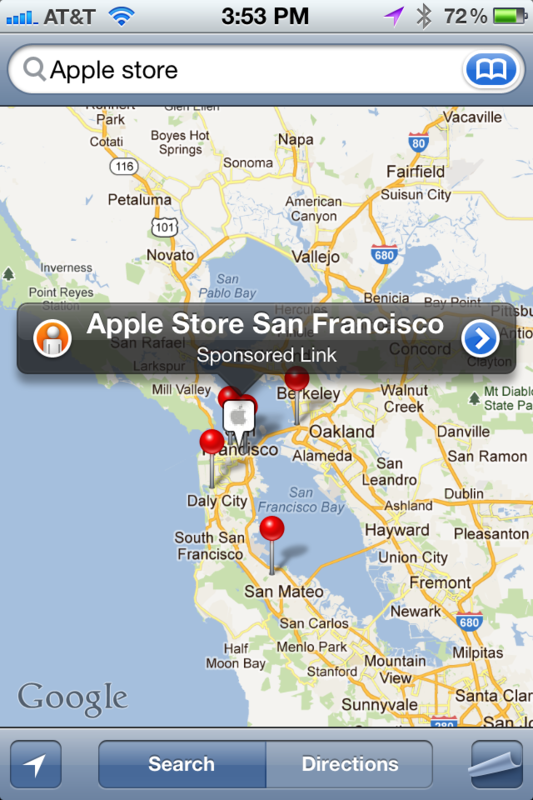 But, after all, a search for Apple Store shows that Apple does sponsor some links themselves. So i contacted Google and asked them about the ads. Specifically if they were a product of Google and, if so, were they part of a licensing agreement for the data. A spokesperson told me that the ads were indeed being served by Google, not Apple. When I pushed for information about whether the ads were being placed as part of a licensing deal for the maps data, Google declined to comment. I also reached out to Apple for comment but have received no answer. If I had to wager, however, I would say that they are. A while back, during the crumbling of HP’s WebOS division, I was told by a member of the WebOS team that Apple had an exclusive deal for Google’s maps data on phones and tablets (outside of Google’s own Android devices and the public APIs of course). When looking into that relationship, I was informed by another source in a position to know that Google does not license map data ‘directly’ to any mobile platforms. This means that if there was a deal cut between Google and Apple, it would have had to have been extremely favorable to Google…say the ability to serve up its own ads right in a pre-installed native iPhone app. Since the ads didn’t appear until 2009, it may have actually been a condition of an extension to the original agreement. So the ads that you’re seeing are definitely coming from Google, but you can’t blame them if you hate seeing them appear there. Google is just aggressively pursuing a piece of prime real-estate on a monstrously successful mobile platform. 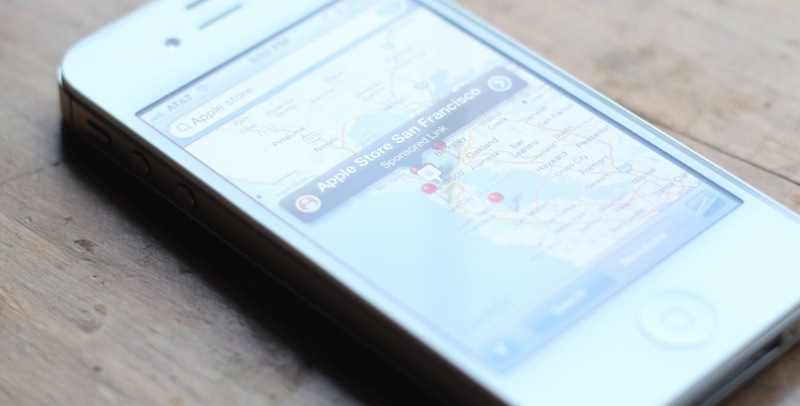 Because the Maps app is a native app, and one of Apple’s core apps for that matter, it is its responsibility to provide its users with the best experience possible. The fact is that the ads are served up in a fairly brash and, well, crude manner. There are no options to turn them off in user preferences. 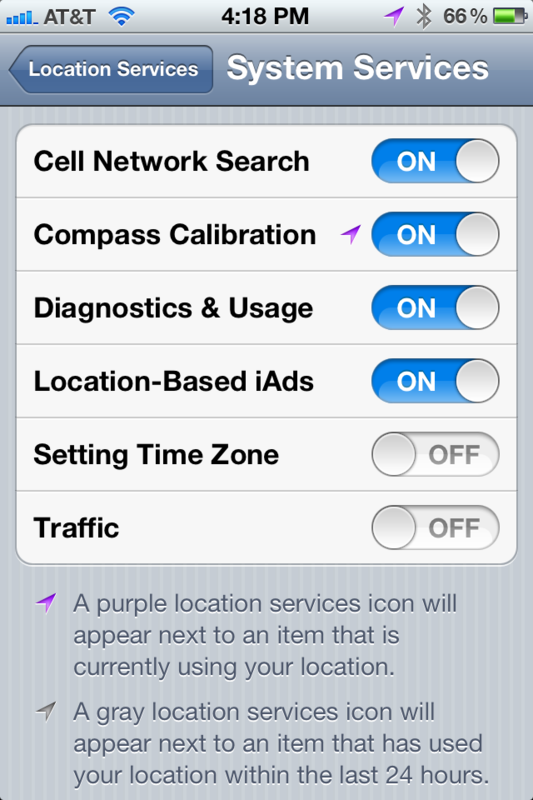 Ironically, there is an explicit preference to turn off location-based iAds at Settings>Location Services>System Services, but this does not disable the Maps ads. Not only that, but the ads often appear to show up across categories indiscriminately. You may get an ad for something completely unrelated to your search, just because you happen to be searching within the area of a sponsored result. So whatever deal Apple made to get the Maps product working with Google’s data, it was still its choice how it implemented it. Apple can be blamed for presenting these ads in a jarring and irritating manner. Frankly, I think that this probably irritates the crap out of Apple. It is currently in the process of trying to divorce itself from as many Google dependencies as it can, including building a new Maps solution. Apple has been quietly building its own solution for maps since at least 2009. That is when it acquired small but innovative maps company Placebase and started up its own ‘GEO Team’. Since then, it has nabbed Google Earth competitor Poly9, wicked 3D mapping company C3 Technologies and is gathering anonymous data for an ‘improved traffic service’. The mapping deal that Apple made with Google was renewed as recently as this year according to Schmidt, but once again, no one knows the time period involved. I would bet that the period is shorter, rather than longer. Just about as much time as it takes to complete the work on its own Maps option. With iAds of course.